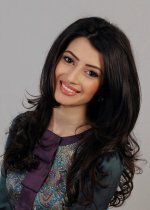 Armine studied with the Honoured Artist of Armenia, docent Anna Mayilyan at the Komitas State Conservatory of Yerevan, where she received her Bachelor’s Degree with Honours (2013) and Master’s Degree in Academic Singing (2015). In 2006 she participated in “One Nation, One Culture” Pan Armenian 2nd Cultural Festival held in Yerevan, Armenia and in 2011 took part in Komitas International Classical Music Competition and Festival in Berlin (Germany). Since 2013 she is a member of Anna Mayilyan vocal ensemble, appearing with this collective on various TV stations, especially on the Public Television of Armenia. Armine has successfully participated in various competitions and festivals. In 2014 she acquired the title of laureate in the 6th International Competition-Festival Renaissance in Gyumri (Armenia). She has honed her professional skills in various masterclasses – in 2011 she participated in the masterclasses of German soprano Verena Rein in Yerevan. In 2013 she took part in the masterclass of Marianna Nicolesco in Braila (Romania) and in 2014 participated in the masterclass of Jean-Philippe Lafont in Villecroze (France).